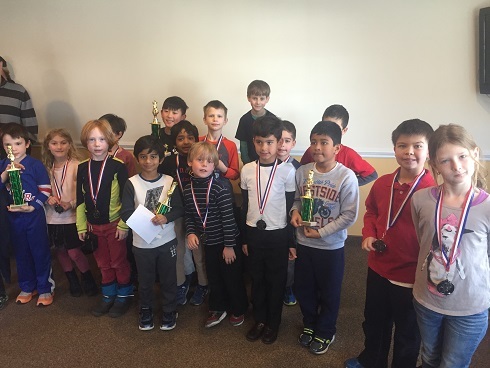 This month’s K-8 Scholastic Championships was a sold out event! Each section was hotly contested through the final round. Justin Guo took clear 1st in the K-2 section with a perfect 4/4 score! 2nd – 4th with 3/4 each went to Thomas Galvin, Vikram Sarkar, and Sarvesh Neelavalli. Avery Beck took 5th place on tie-breaks. The final round of the K-5 section was a nail-biter. Nicholas Stephens and Oliver Stafford, both with 3/3, faced off on board 1, with Asher beck hot on their heels with 2.5/3. Oliver won one of the longer games of the round to take sole 1st place. Asher Beck finished 2nd with 3.5/4 and Eddie Li, Nicholas Stephens and Anika Bhat finished in 3rd – 5th respectively with 3/4 each. The K-8 section was one of our strongest on record with four players rated over 1300. With such fierce competition it was ultimately impossible for anyone to finish with a perfect 4/4. Michael Fotin and Luis-Jaime Casenas finished with 3.5/4 with Michael taking the 1st place trophy on tie-breaks. Ethan Cushman finished in sole 3rd with 3/4 and Luis-Joshua Casenas and Anibal Loureda finished 4th and 5th with 2/4 each. Thank you to everyone that made this such a memorable event. All of the participants should be commended for all of their excellent displays of sportsmanship and composure throughout the tournament.